This segment contains two styles. Style #1: overbraided twists. 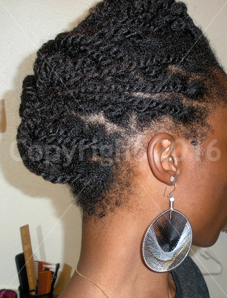 Style #2: overbraided twists with pompadour. 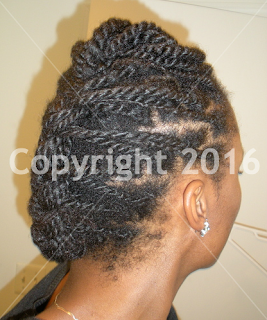 Style description: Style #1 - overbraided twists. 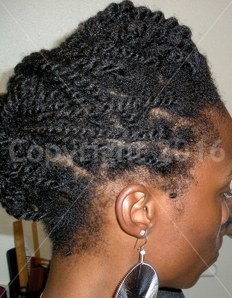 Style #2 - overbraided twists with pompadour. Difficulty level: Style #1 - 2/5. Style #2 - 3/5. 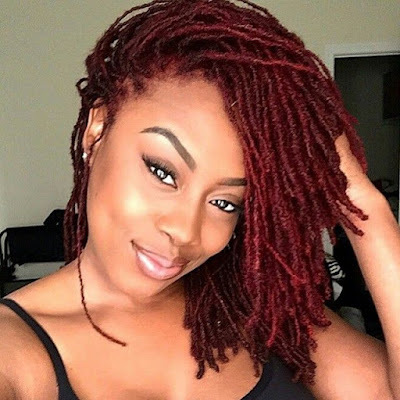 HOW TO For OVERBRAIDED TWISTS only: Start off with twists or braids. Braid them into one big french braid from the crown down to the back of your head. (Use the over-braiding method instead of the under-braiding method. Here is a video tutorial: overbraid.) After braiding, tuck the tail under your french braid and near the nape. Use a few bobby pins to secure. Voila! 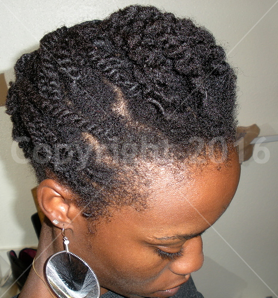 NOTE: To creat the hump in the front like in the photo, start off braiding loosely at the crown. Also, note that this style can also be done on loose hair. HOW TO For OVERBRAIDED TWISTS with POMPADOUR: Start off with twists or braids. Undo a few twists/braids in the front middle section of the hair. This will create a twistout/braidout bang. Using bobby pins, pin the bang down towards the crown of the head. Now take your remaining twists/braids and braid them into one big french braid from the crown down to the back of your head. (Use the over-braiding method instead of the under-braiding method. Here is a video tutorial: overbraid.) After braiding, tuck the tail under your french braid and near the nape. Use a few bobby pins to secure. Voila! NOTE: This style can also be done on loose hair. Thanks for sharing. I really like the simplicity. I'm hoping to incorporate styles similar to this during the winter instead of relying on extensions. Can't wait till my twists are long enough to get into one braid.. I am currently still on two cornrows:-) But am getting there, a day at a time! Thanks for the inspiration!